It is often useful to make data acquired by the oscilloscope available to other application programs. 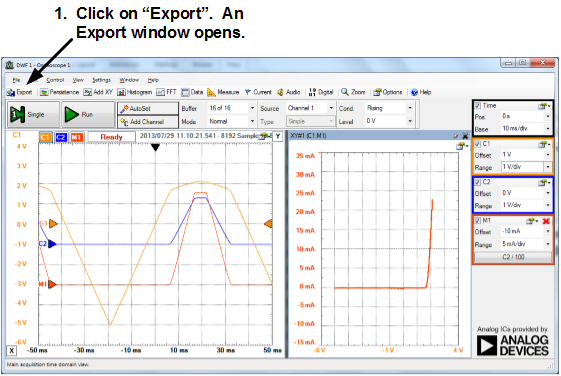 This process can be easily done using the Analog Discovery™ with the Export function on the oscilloscope. 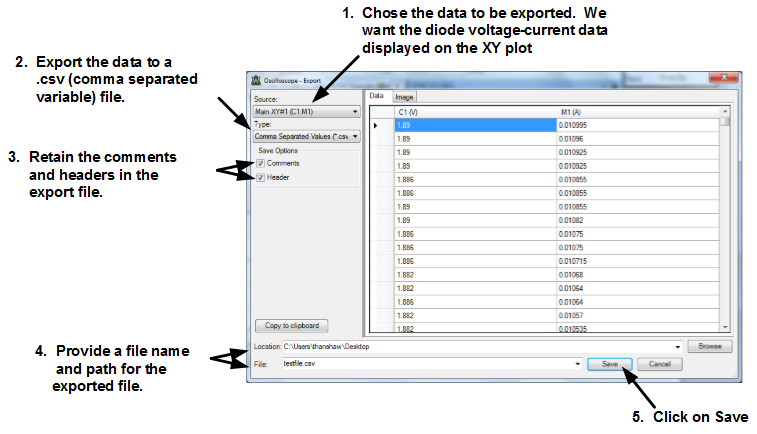 In this project we will be exporting the voltage-current data of a light emitting diode. Create the circuit and set up the waveform generator and oscilloscope as described in the Oscilloscope XY Plots project. Your circuit should be set up, and your oscilloscope display should look similar to the display shown at the end of that project, before you begin this project. We will export the diode voltage and current as determined in the fifth Scope project. The current through the diode is the current through the resistor, I, per the schematic to the right. This current was created as a math channel in the fifth scope project. The voltage across the diode, V in the schematic, is available as channel 1 of the scope. If you don't have Microsoft Excel, use any other application program which will read comma separated variable files1. If you do have Microsoft Excel, open it now, click on File in the menu bar and select Open. The Open dialog box should appear. In the Open window, navigate to the desired file. You may need to view All Files to see the .csv file. Microsoft Excel will now display the data. In the Waveforms Scope instrument, export the same data as tab delimited data. Copy the data to the clipboard. Paste the data into both Excel and Notepad. Export the data as an image in Portable Network Graphic (*.png) format. Paste the image into a word processing program—such as Microsoft Word®. 1If you don't have software which accepts comma separated variable files, go back to Step C and select Tab Delimited Values (*.txt) in the Type box. Re-export the file and open it using Notepad.